Call for video projector hire Glasgow, data projection equipment rentals, hiring multimedia presentation projectors and audio-visual digital electronic lcd machines in Strathclyde. We have a full range of professional video projection equipment available for rental and our professional staff can advise as to what equipment will best suit your presentational requirements & price range. If you are looking to use a projector for a multimedia presentation using a laptop computer & program such as Microsoft Powerpoint to a small group of people in a boardroom then one of our SVGA projectors will most likely suffice for the job. They will operate directly from the laptop computer using the external VGA port (which must be enabled) and operation is straightforward, with most decent modern video projectors able to autodetect whch outputs are receiving a signal and display the according image on the scree with a mininum of fuss. All you need is a VGA cable to run from the laptop to the data projector input, plus a mains socket nearby to plug the projector into. (We can supply a standard 13 amp mains extension if required). We supply appropriate cables with the projector hire at no extra cost. For larger gatherings then we would advise the use of an XGA data projector which has a higher light output (measured in ANSI lumens) which offer the same ease of use, but with improveed brightness & resolution. 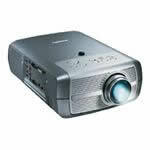 Yes indeed, for video projector hire Glasgow we are the people to speak to. We can supply a range of other accessories for use with video & data projectors, for instance, we carry a wide range of screens - standard tripod screens come in 4 foot, 5 foot & 6 foot sizes. We have pull down screens (which must hang from something overhead, eg. hooks, a scaffolding bar, etc), and we have a range of fast folds in various sizes. For most presentations applications we find that a tripod screen is the easiest, cheapest & most suitable option. We'll be happy to discuss your requirements & offer advice as appropriate. In addition to screens we can provide stands, and ceiling brackets for our projectors for situations where a suitable table is not available. In general optimal projector placement is twice as far back from the screen as the image is wide (ie. a six foot image requires the projector to be 12 feet back, although adjustment is possible using the zoom lens), with the bottom of the lens & projections screen in line (the digital keystone can used for image correction when optimal vertical alignment is not possible). The projector should ideally be placed at 90 degrees to the center of the screen as offsetting the projector will skew the image - our XGA models generally offer a horizontal keystone adjustment facility if cental placement is not possible. Our customers often ask for other projections accessories, one of the most common uses being in conjunction with a DVD or VHS cassette player for the showing of films or promotional clips. We do stock a range of VHS & DVD players, plus appropriate cables to connect them up to our digital video projectors. If you require assistance with DVD creation then please give our Edinburgh office a call as they specialise in short DVD creation. We can create autoplay, autolooping DVDs which are suitable for playing back sponsors messages at events or adverts & infommercials.For DVD creation please call 0131 558 3824 & ask for Rock.